The Board of Control for Cricket in India (BCCI) has finally Team India for the forthcoming ICC Cricket World Cup 2019. The selection panel under the leadership of MSK Prasad has taken some tough all for the Indian team. World Cup will commence from May 30 in England and Wales. Where India will start their campaign against South Africa on June 5 in Southampton. There were lost of competitions between the players as no.4 position and Amabti Rayudu has failed to make the cut and even the x-factor Rishabh ant failed to make the mark. 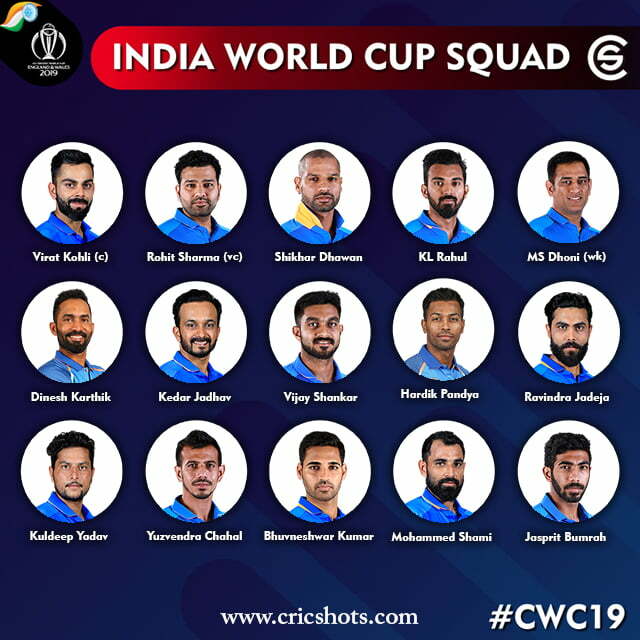 The Indian selectors have put their faith in the veteran Dinesh Karthik and the youngsters, KL Rahul and Vijay Shankar. Surprisingly even Ravindra Jadeja and KL Rhas been able to find a spot for himself. Chairman of selectors, MSK Prasad stated that Karthik was preferred over Pant due to his superior ‘keeping skills. He also said that four additional medium pacers will travel to England with the team as practice net bowlers. Jadeja took up the third spinner’s slot, alongside wrist spinners Chahal and Kuldeep Yadav. The four pacers in the side were already decided as Jasprit Bumrah is expected to spearhead the pace attack along with Mohammed Shami, Bhuvneshwar Kumar, and all-rounder Hardik Pandya.